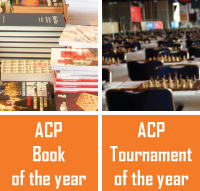 ACP Board received a request from Premium member GM Alexei Shirov to publish the letter he sent to FIDE. We are concerned about the situation. However, before issuing any statement on the matter, we wish to ask the Latvian Chess Federation to express its position. We will be publishing their reply as well. On 10th of January I filed the complaint against Latvian chess federation and also made the flag change request. It was denied because, as I was informed by FIDE, Latvian chess federation (later in the text I will use the abbreviation LCF) was against me changing the federation. According to the new facts that I would like to share here, it is untrue. Well, of course it's true that they want to receive 30 thousand EUR for my transfer (who wouldn't want?) but they have zero interest in collaborating with me and respecting my sporting and professional rights in the country. As I stated in the previous letter, they even refuse to register in FIDE some small local events that I might be organizing from time to time together with my friends - chess lovers. Оставив в стороне тему конфликтов, хочу ещё раз задать несколько простых вопросов о формировании команды на Олимпиаду. Когда будут приняты решения? Сколько человек попадают в сборную по рейтингу? Сколько из чемпионата Латвии? Сколько по решению федерации? Как будет приниматься это решение - общим голосованием или одним человеком? Не знаю, известны ли ответы на эти вопросы другим ведущим Латвийским игрокам, но, думаю, раз я ничего не знаю, то для меня сейчас самый подходящий момент их поставить. Хотелось бы получить быстрый хотя бы предварительный ответ. For those who don't read Russian, I will explain that in my short letter I requested to provide me with some information regarding the Olympic team selection. The rumours that I had already been excluded from the team were already so strong that I at least needed some clarification or better direct confirmation or denial of those rumours. And of course, I was also interested in the selection criteria - after all I am still N1 in the country with ELO 2652, N5 player has announced that he is not interested to play for the team, while N7 (who might then be my substitute if I don't play) has ELO 2476 . I think all this proves that if I am excluded from Latvian national team for which I played five times in Olympiads, it would have nothing to do with the sporting criteria. Only with personal reasons. So, on 8th or 9th of February i didn't get any answer to my email, it's OK, only two days. But on 10th of February I decided to go to the Riga Chess Club where they held the annual Aivars Gipslis rapid memorial. I was not playing myself, the reason of my coming was to meet Aivars Gisplis' widow, but at some moment (at about 11 AM Latvian time) the arbiter and also the Executive director/Rating officer of LCF IA Alberts Ciminis asked me to talk to the president Aris Ozolins (who happened to play in the rapid event) and try to settle the conflict situation. I agreed upon the condition that Albert would be present too, so we both set at the table where Ozolins was sitting. Also sitting at the table were former Olympic team members GM Normunds Miezis and IM Vladimir Sveshnikov. I do complain about such unjust words and treatment by the president of the federation I still represent, but my by now 2nd complaint is not even the main thing. What matters is that Aris Ozolins has made it (also for already 2nd time in last two monts) 100% clear that I am no longer welcome in Latvian Chess Community. Under these circumstances I am ready to leave LCF even though i still love my country. But I can not leave LCF because Mr. Ozolins also wants money from the possible new federation! I would call it greed. I have played Chess Olympiad (up to now always on 1st board and almost always successfully or at least reasonably) since 1992 missing only Bled 2002. I want to play in Batumi that could become my 13th Olympiad. These days it may be the most serious tournament for me, I devote myself completely for that event, even skipping Bermuda party sometimes as I care about the result! I would like to play for Latvia but we see that it is no longer realistic or even possible. Then I would like to play for some other country, at least two countries expressed the direct interest at the moment. but obviously those countries are not ready to pay 30 thousand for me towards Latvian federation. This amount of 30 thousand would be logical if Latvia were highly interested in me to stay. But that is not at place right now. I also want to play in other official FIDE or ECU events but not under the Latvian flag anymore. Therefore I kindly ask you, dear FIDE officials, to give me an opportunity to play under the FIDE flag as long as it needs the mess to be ended. Then I would calmly choose the new "chess fatherland". But at the moment I am just a chess refugee in the country I am born in. It's a great country, i still live there and love it very much but there is no chance to continue in Latvian chess community as Mr. Ozolins has simply too much power. I could talk more about that but at the moment it isn't necessary. Mr. Ozolins and Mr. Cimins are welcome to share their version on what is occurring between me and LCF. But my personal opinion is that it should just end, it's too late for me to be under the Latvian flag again.